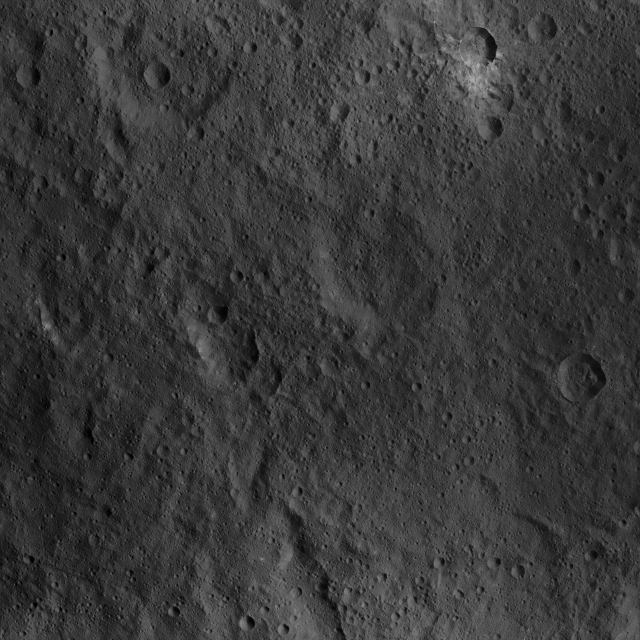 This interesting Contextual Image (or "CTX Frame", for short) of the Dwarf Planet 1-Ceres, taken by the NASA - Dawn Spacecraft on October, 7, 2015, shows us an highly Cratered Terrain located (---> centered) at 2� North Latitude and 304� East Longitude, immediately to the West of the intriguing Mountain known as Ahuna Mons. North on 1-Ceres is up. An almost (or just "semi") Linear Surface Feature cuts across the whole scene from South to North-North/West. A small Unnamed Impact Crater, located in the Northern portion of the image is surrounded by Asymmetric Ejecta, composed of a mixture of (mostly) light and dark (unknown, in origin) Material. On the other hand, a small, and still Unnamed Impact Crater visible at center right (Dx - East) of the picture, displays steep Flanks and a Hummocky Floor. The original photo was taken from an altitude of approx. 918 miles (such as about 1477,37412 Km) from the Surface, with a resolution of roughly 394 feet (such as about 120,0912 meters) per pixel. This image (which is an Original NASA - Dawn Spacecraft's b/w and NON Map-Projected frame published on the NASA - Planetary Photojournal with the ID n. PIA 20147 - Dawn HAMO Image 84) has been additionally processed, extra-magnified to aid the visibility of the details, contrast enhanced and sharpened, Gamma corrected and then colorized (according to an educated guess carried out by Dr Paolo C. Fienga-LXTT-IPF) in Absolute Natural Colors (such as the colors that a normal human eye would actually perceive if someone were onboard the NASA - Dawn Spacecraft and then looked ahead, towards the Surface of 1-Ceres), by using an original technique created - and, in time, dramatically improved - by the Lunar Explorer Italia Team.